It seemed so crazy that we have four dogs (yep, four! ), and yet we were still buying shampoo for them from the store. We make soap. Almost daily. Makes no sense, right? So, not too long ago we decided to give dog soap a go. The result has been quite fun. 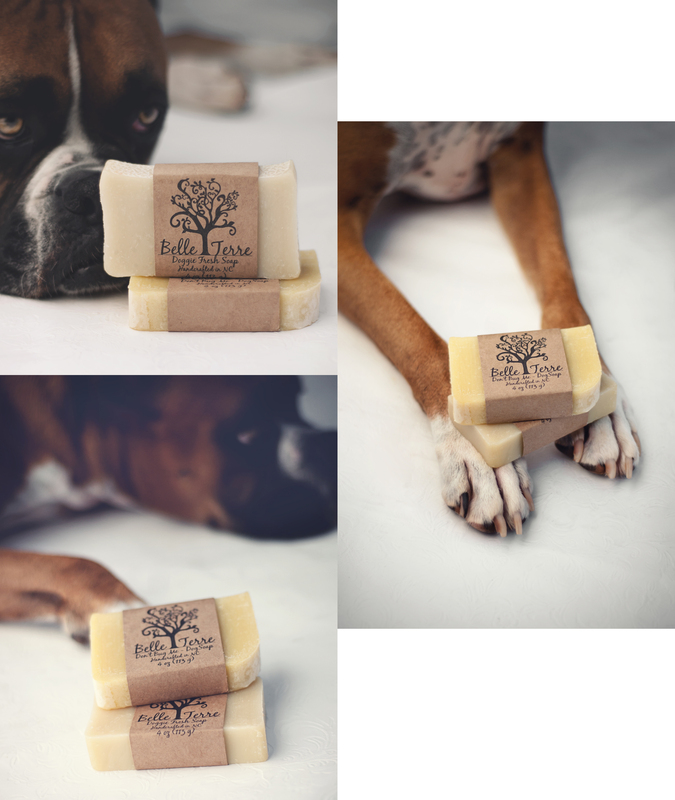 We have created two bars so far: a Doggie Fresh bar with a refreshing blend of clove, lemon, and peppermint and a Don’t Bug Me bar that includes a blend of lemon, citronella, and rosemary. Yum. We’ve been selling these new soap options at Atherton Market for a month or two and have had very positive feedback. Others have said what I found – it’s much easier to clean the tummy of a dog with a bar soap. Especially a big dog who doesn’t particularily like baths. As a side note, although we formulated this for dogs, we’ve been selling quite a few for people use. If you’re a fan of the scents, there is not reason you can’t use it too! Isn’t he adorable? I met him person not too long ago and can confirm that in spite of a clearly boxer bark, he’s all baby. PS: Early next year we’ll have another bar available specifically formulated for dogs with hot spots and other coat problems. Our forever itchy dog Sparky is our test case…we’ll let you know how he does.